She was born on 4th December 1904 in Camborne, the daughter of Richard James Bray and Bessie (née Wills). 1. John Rowett was born in 1795, in St. Austell. He married Harriet (surname unknown), who was from Jersey and had at least ten children, the 6th being my great x4 grandmother Eliza Rowett. John had died by the 1851 census as Harriet was listed as a widow, aged 56, living with her 5 youngest children. She was still alive on the 1881 census, in Tywardreath, aged 84. 2. Eliza Rowett was born in 1832, in Fowey, although she and her family lived in Tywardreath on the 1841 and 51 censuses. She married William Pearce Wills (b. 1822) and had a son, William Henry Wills, on 20th August 1856 in Tywardreath. He was my great x3 grandfather (Joyce's grandfather). 3. William Henry Wills was baptised on 20th August 1856 in Tywardreath. He was Joyce's grandfather (my great x3 grandfather). He married Elizabeth and can be seen on the 1891 census with their children - including Bessie Bray, who was Joyce's mother. 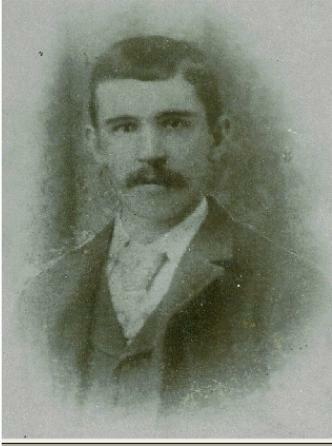 William died in 1893, when he was young. The 1901 census shows Elizabeth as a widow, aged 46, with some of her children. 3. Margaret Joyce Bray (1904-1974), aged 69. 5. Bessie Sylvia Bray (1908-2001), aged 92. 6. Romilly Bray (killed aged 21 in a motorbike accident). *of all these children, only Joyce had any children of her own, Trevor and John Cory. She married Wearne Dunstan Cory on 29th June 1929. Seth had married a divorcée, but was killed at war soon after. His widow was apparently disowned by the Bray family. They had no children. Both Uncle Jim and Aunty Sylvia were unmarried. My grandpa remembered both his grandparents, Richard & Bessie. However, Richard apparently was sent to a home when he was old, and he was never mentioned in family discussions. Nore is he buried in the Bray family grave in Camborne. Grandpa remembers Bessie dying during his last year at Truro school, when he was 18, that would have been about 1951. 1. Trevor Wearne Cory (1931-2001), aged 70. 2. John Romilly Cory (1932-2002), aged 69. Joyce suffered from lung cancer towards the end of her life, and died on 24th May 1974, when she was 69. Wearne outlived her by thirteen years, dying on 26th June 1987. Both are buried in Camborne. 6. John Romilly Cory was born on 11th November 1932 in Camborne. He went to Egypt for his National Service in the early 1950s, and married Marlene Bennett Pellow at Tuckingmill on 10th November 1956, when he was 23 (a day short of his 24th) and she was 21. John passed away on 1st October 2002, aged 69. He is buried in Warwick. 7. Timothy Ian Cory was born on 30th May 1960, in Redruth. He and his family moved up to London in 1974/5, and he married Angela Mary Bates on 26th October 1985, in Harrow. 8. Thomas James Cory (myself) was born on 15th March 1988, in Edgware hospital. Lived in Oxhey, Hertfordshire. 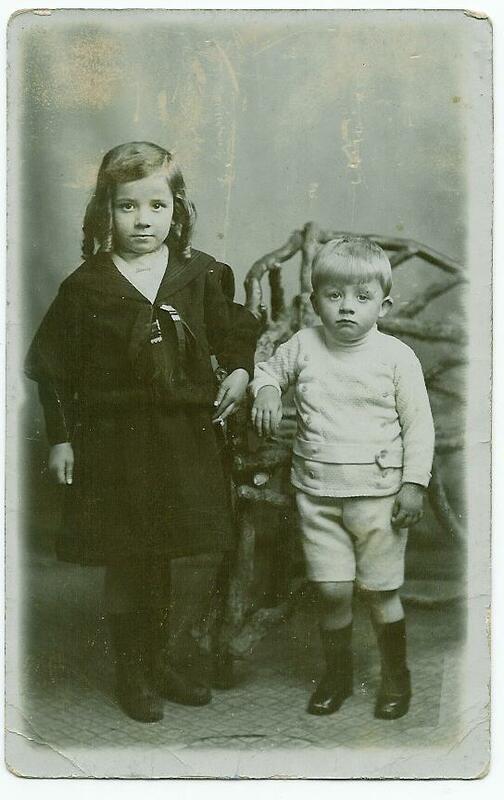 My great grandmother Joyce with her brother Seth. Taken in about 1910. My great great grandfather Richard James Bray. 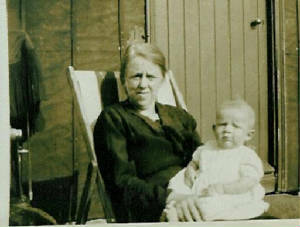 Bessie in the early 1930s with either Trevor or John (grandpa). 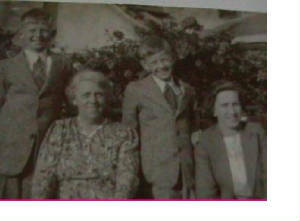 John & Trevor with their mother Joyce and granny Bessie. Taken in the mid 1940s.